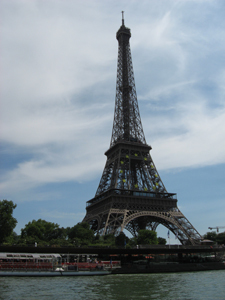 To get started in Paris listed below are the monuments of Paris not to miss. To give you some historical perspective I’ve listed them by date built or started…many took years to build. I’m not generally a tour person but I always enjoy a bus tour when I first get to a city, that way I get an overview of where I want to go later for a more in-depth look and I don’t wind up walking on my ankles from exhaustion. We did a double-decker bus tour in September and sat at the top and could get off and on when we wanted to visit the monuments of Paris. We’ve also done a Seine river tour in August when it was too hot to walk the streets. Really enjoyed it but it was hard to hear the commentary which was frustrating. However it was a beautiful relaxing view and you see the monuments of Paris from a different perspective. Speaking of perspective, I've put together a tourist map Paris with the monuments flagged so you can see where in the city they're located. It's the oldest of the monuments of Paris if we go by when the first stone was laid, 1163. However, it wasn’t finished until 1330 taking almost 200 years to build. A Gothic cathedral, it sits on the site of a Roman temple. Renowned for its flying buttresses and beautiful rose stained glass windows. Pillaged during the French revolution in 1793, the cathedral was closed from 1795-1802. If you are feeling energetic, a 400 step climb to the top of the towers will get you a good view of the gargoyles and of city of Paris. Free guided tours available or audio tours for a fee. Go to a Mass for a cultural adventure. You’ll see the unique French who actually go to church and I guess, the foreigners. Built as a fortress in 1190 to protect Paris from Viking raids. Rebuilt during the Renaissance by Francis I, then 400 years of improving and enlarging by the French kings and emperors. First opened as a museum in 1793. Houses over 30,000 works of art. It is huge, some say the world’s largest, the Louvre Paris France definitely contains one of the most important art collections in the world. Given its importance in the world of art and prominence as Paris’ most important museum it is crowded, some say only 2nd to the Vatican. Go off-season during the week for fewer crowds. If that’s not possible don’t worry, once you get in it’s so huge that it’s not so bad. If you want to see the Mona Lisa and not have 5 rows of bodies in front of you go at soon as it opens and make a bee line for it or go just before closing, as the museum stays open some nights late. Visit the museum's official website for most up to date times and exhibits. Take a 90-minute guided tour or grab a brochure at the information desk for “Visitors in a Hurry” self-guided tour to see the highlights like Venus de Milo and the Mona Lisa. There is also a 4-hour audio tour available at the museum entrances. Buy your tickets ahead. In the us and Canada at ticketweb.com Other countries fnac.com or ticketnet.com. Tickets also available at participating stores in Paris. 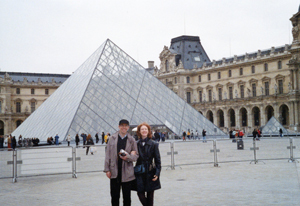 Or, the Paris museum pass includes the Louvre and many other museums. One of the oldest of the monuments of Paris, a Gothic church built in 1248 and one of the oldest in the world. Took only 5 years to build (vs. 200 yrs for Notre Dame) and had one architect, so it is architecturally pure (i.e. not mucked up by other architects ideas) Commissioned by Louis IX (the only French king to be made a saint) as a shrine for relics of the crucifixion. The 15 stained glass windows are considered among the greatest in the world. Great to visit on a sunny day to really get the effects of the windows. Go to an evening music concert for a rich cultural experience. Window also beautiful then too. We were going to go one night, as recommended by my husband Gildas’ Parisian uncle but we were too tired – next time it’s a must! Commissioned by Napoleon in 1805 to commemorate his victory at the battle of Austerlitz. 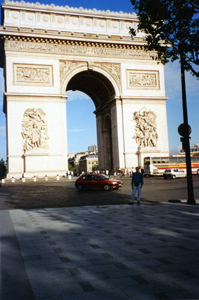 This monument of Paris is situated at the center of twelve avenues that radiate out from it. Go to the top (small admission fee) (284 steps) 50m (164 ft.) for a fabulous view straight up the Champs-Elysee; see the Louvre, the Obelisk at the Place de la Concord, and the Grande Arch de la Defense. Use the underpass to get to it. The cars zip around the monument so you don’t want to play chicken as you cross the road. During the Prussian war 2 French businessmen made a vow to God that if Paris were spared a Prussian invasion they would build a church in honor of the Sacred Heart of Jesus. Paris was indeed spared and work was started in 1875 and took 44 years until completion in 1919. Built in the Romano Byzantine style. In Montmartre on Paris’ highest hill. Greatest views of Paris from the white dome. Tight narrow winding steep stairs to the top. 30 mi. visibility on a clear day. Walk up the hill to the church or take the Metro to Anvers then the cable car (funiculaire) up to the outside of the church. The inside isn’t the attraction it’s the view and the location, Montmartre that you’ll want to explore afterwards. Who doesn’t think of the Eiffel Tower when they think of Paris? An Eiffel Tower picture is worth a thousand words and we've taken our share of photos. It could easily be the most photographed of the monuments of Paris. Built in 1889 for the Universal Exhibition. This monument of Paris was the tallest building in the world until 1931 when the Empire State Building was built. elevator only for level 3 (900 ft.) The higher you go the more expensive the ticket. Go at night to avoid the crowds to the top. In September we went an hour before closing after a nice dinner in the area and walked right into the elevator. The lights of Paris at night and the view were spectacular and it was so much more fun because hardly anyone was there. But if you want the daytime view obviously you must go during daylight. During the daylight hours in summer show up as soon as they open. Otherwise there is a long line and wait. I don’t get going that early but starting early is always the way to avoid crowds at the popular monuments of Paris. Summer lines are long. To go to the top and back can be anywhere from 90 min. to 2 hours. Crowds worst on weekends and holidays year round. During the week less crowded off-season (mid September to mid June). If you are comfortable committing to a date and time, you can buy your tickets ahead, on-line, on the Eiffel Tower’s official website, choosing the date and time you want.